I only posted this on Anzac Day this year but with it being the 100 year and week anniversary of the theatres of the Western Front, (Fromelles and Pozieres) I thought I should post it again. 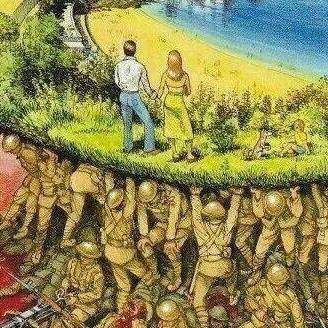 I don’t know what this is called officially, but I call it “on the shoulders of soldiers” because that’s what I see. I think it captures the essence of not only The Western Front and Gallipoi, but the sacrifice of all wars down through the ages and the subsequent bequest by way of the inter-generational inheritance and opportunity depicted by the young couple dreaming their dreams of their future together, juxtaposed against the mud, the blood, the grind and the drudgery of war and the propinquity of men in the trenches that allows for those dreams to be entertained, in the first place.